TV Girl: What is it about "Lost in Translation?" When I think of "Lost in Translation," I think of a movie that pioneered an entire army of ambiguous endings. Family dramas and friendship dramas began to spike in the indie world, at a time when indie movies were suddenly very important, leaving the epic, Spielbergian masterpiece behind. We began to see more movies like "Sideways" and "Junebug," movies that follow a couple of characters through a sort of elongated vignette, revolving not around plot but around individual discovery. Now, I know that "Lost in Translation" was not the first movie to have an overtly ambiguous ending. It was not the first movie to swap the idea of plot with the idea of people. But, it's the first movie that stands out in my mind when I think of the millenial indie drama. Before "Lost in Translation," there was "American Beauty." "The Hours." "A Beautiful Mind. "Far From Heaven." Sweeping movies. Handsome movies. Movies with a lofty, dramatic perspective. 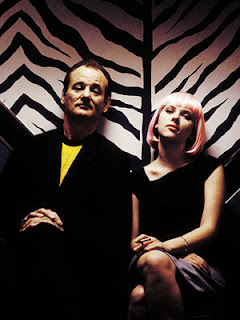 "Lost in Translation" was one of the first movies to scale it way down. While "American Beauty" looks at people from the landscape of life and death, beauty and prejudice, young and old, now and then, "Lost in Translation" localizes its landscape to one particular, seemingly insignificant friendship that takes place in Tokyo, Japan. While movies like "American Beauty" pontificate on what it means to be alive, using symbolism, multiple story lines, and voiceover from the afterlife, "Lost in Translation" simply shows us one example, one that is not significant at all, and lets us decide for ourselves. ily and its many relationships, its little tragedies, how the members of the family react to outside stimulus, to things like faith and history. It ends on a sad but uplifting note, and instead of pondering the grandiosity of a movie like "American Beauty," with all of its wondrous interweavings and genius wrappings-up, we find ourselves thinking about our own family. It is then not until much later that we remember we saw a film at all. A similar reaction is brought on by the itty-bitty movie "Pieces of April," or the better-known comedy "Sideways." Movies like this don't become spectacles that we discuss at length over coffee or liquor, but little pockets in our hearts that grow deeper over time. "Lost in Translation" is one of these pockets for me, and I now find myself wondering why. are made up of the things we can't see, can't hear, can't point out from far away. They're not even made up of the way we feel about each other. They're made up of the things we experience together, as friends. The way that Bob and Charlotte feel about each other seems, in a way, inconsequential. It is never laid out in full. We all must agree that there is some sort of territoriality, though not the hostile kind, simply the kind that keeps us wanting the best for the ones we care about. The movie is made up of Bob and Charlotte's little interactions, the fact that they seem to understand e ach other at a deeper level than we'd expect. Their friendship almost seems to exist simply upon this notion: that Bob and Charlotte both, at this moment in their lives, need somebody to understand them. Once the purpose is served, and both seem to better understand themselves (for they seem to understand each other better than they understand themselves), the friendship must end. Tokyo is simply the place that it happens, the source of their initial bond, a landscape to influence the decisions they make throughout the day. Once the Tokyo trip is over, so ends the illusion and the friendship that served to teach them that life does not begin or end in any specific order, but instead, is just a series of relationships and the ways that they make us change. These are just my musings, the things I think about while watching movies. I watched "Lost in Translation" this morning on the treadmill, and I couldn't get it out of my head. What is it with this movie? Nothing seems to happen. The dialogue is so sparse, so rarely the milestone of a scene. Yet, it moves us. It moves me. I'm interested in what other people think. If you have an opinion, let me know. Giant Robots and Jet Li still do it for me.